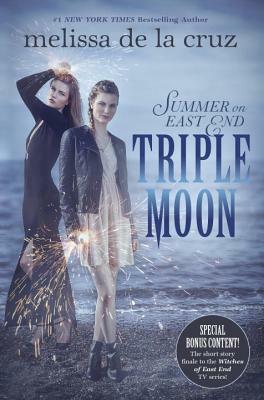 Welcome to my stop on the Triple Moon blog tour! Today I have a "10 Random Things About Me" guest post by author Melissa De La Cruz! When I was eleven I was determined to name my future children after Legolas and Arwen Evenstar. Actually I was just going to go with “Evenstar” for my daughter, I thought it was the prettiest name ever and as you can tell I was majorly into the elves. Legolas and Arwen were my favorite characters in Lord of the Rings and Arwen isn’t in the main text, she’s in the appendix! I was a child model and appeared on the cover of Mod Jr in the Philippines. Also when I was eleven. Eleven was a big year. My favorite color is fuschia. I was class president junior year of high school and junior year of college. Junior year seems to be when I peak socially. I have a Maltese named Mimi, she is not named for Mimi Force, our daughter named her. Moulin Rouge is my favorite movie. I went to see it four times in the theater. I used to have a doughnut for breakfast every day in my 20’s. Sadly those days are over. I married my husband because he was the only guy I’d ever met who had read all six original Dune novels…and was cute! Ladies, find a cute nerd and marry him. I started out wanting to be a poet. I have a really lovely handwritten rejection letter from the New Yorker about one of my poems. I love my job. I write because I love to read, and I wanted to be part of that conversation.